Colombia is the second most biodiverse country in the world, as measured by species richness. But over the past half century it has also been home to a brutal civil war, inflicting death and displacement on its citizens, with negative repercussions on its natural environment. However grim, conflict itself is not necessarily bad for biodiversity. While the lack of governance in war zones can encourage illegal mining and deforestation, a resulting reduction in development can also mean the natural environment is not exposed to pressures it might otherwise face. So, peace brings a fresh environmental challenge. In November 2016 the Colombian government and the Revolutionary Armed Forces of Colombia (FARC) signed a peace agreement to put an end to more than five decades of conflict. The optimism has since been tainted by delays in the process and an increase in the number of human rights activists murdered this year. All this makes it a delicate time for Colombia and its natural riches. Brigitte Baptiste, director of the Humboldt Institute in Bogotá, described the period as a “great ecological experiment”. Throughout the text of the peace agreement, the goal of maintaining social and environmental sustainability was stressed. It called for the establishment of agricultural workers’ associations, for example, with the aim of protecting the environment, while substituting illegal drug crops for food production. The agreement also set out plans for environmental zoning to mark out the agricultural frontier. It’s not going to be easy. Since the signing of the peace agreement there have been some worrying trends. Deforestation increased by 44% in 2016, primarily in areas previously controlled by the FARC. These figures are aligned with some recent research showing a correlation between the presence of the FARC and lower levels of deforestation, due to the guerrilla group maintaining a level of control over the forests in its territory. Production of coca (which goes into making cocaine) is also on the increase, due in part to a perverse incentive for coca farmers to increase the size of their crops in order to receive greater subsidies for switching to alternative crops as part of the peace strategy. 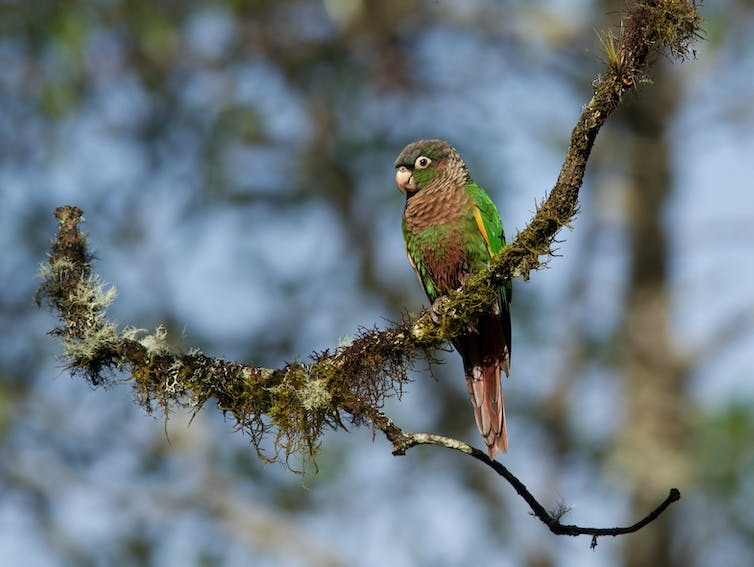 Aside from illegal activity, there are major national plans for development, including mining concessions and a massive infrastructure programme of 8,000km of roadways, all of which put Colombia’s biodiversity under threat. However, peace also creates opportunities. Colombia could now improve its governance and conservation policies, and properly monitor the biodiversity of zones previously off limits during the conflict. For instance, 88 new species have been discovered in Colombia since the peace agreement in areas previously considered too dangerous for research. At the International Congress for Conservation Biology (ICCB) held in Cartagena, Colombia in July 2017, conservationists from Colombia and across the world discussed some of these key opportunities. Protected areas are being expanded, and there is a major drive for more eco-tourism – especially for bird lovers. 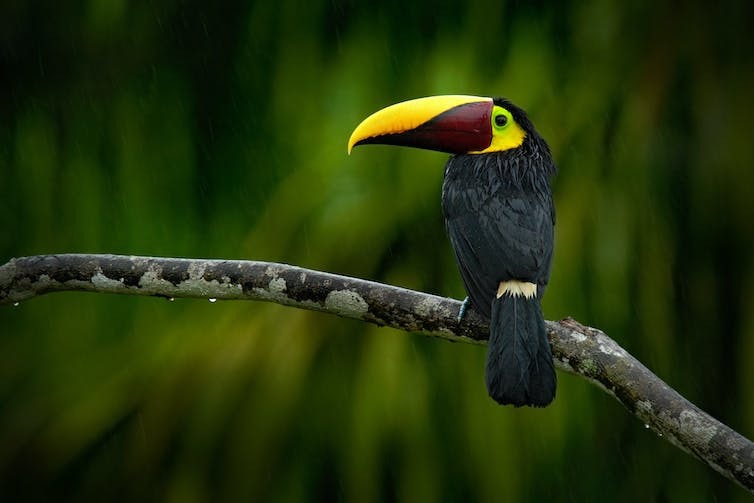 Colombia has 1,826 different species of birds – more than any other country. Colombia’s national development plan promotes a strategy of green growth and “as much market as possible, and as much state as necessary”. Consequently, new market-based conservation initiatives are emerging that attempt to find a compromise between economic development and nature conservation. One example is the emergence of “biodiversity offsetting”. This aims to compensate for the environmental impacts of large mines, dams or roads by conserving or restoring an ecosystem of greater or equal biodiversity value as to that that is being damaged. But these mega projects still tend to become sites of conflict. In fact, the Environmental Justice Atlas lists 125 environmental conflicts in Colombia (only India has more), most of which arise from mining or drilling for oil and gas. Popular consultations are now cropping up around Colombia, where communities have been voting against mining in their territories. Many feel that their livelihoods and the extractive industries are strongly incompatible: “agua, vida o minería” (“water, life or mining”). Meanwhile, Baptiste, in her plenary speech at the ICCB, spoke of “minería sí, pero no así” (“mining yes, but not in that way”), outlining a wish for responsible mining and a belief in the existence of solutions that can make development compatible with nature conservation. Baptiste presented a breakdown of where biodiversity is located in Colombia and who is in charge of it, with protected areas representing 14-18% of the national territory, and mining and energy concessions representing 25%, around 1% of which has thus far been transformed by mining activity. It is critical that conflict between armed groups is not simply replaced by conflict between communities and mega projects over the protection of their livelihoods and environment. It is unclear as yet how life, both human and non-human, will evolve in Colombia after the conflict. Certainly, there is a long road ahead to transition this country into a truly post-conflict nation. The challenge, and the opportunity, is to build a peaceful society while maintaining its biological and cultural diversity, and develop a model for other biodiversity-rich countries affected by war.